A perfect leaf stenciled on our driveway. Beauty is indeed all around us, even if sometimes we have to look a little harder. Join me in visiting the other October Fest participants, and be sure to tell Rita "Happy Birthday" when you visit her page!! This is beautiful! Love the colours and the bracelet. Wow! Beautiful, beautiful piece. I am in love with all your work in general, but today I am just in awe! I love that bracelet. Those colors are wonderful! Another one that would be perfect with my clothes. It is gorgeous! Oh, I meant to tell you what a great picture that was of the leaf under the snow, but I was so caught up in drooling over your bracelet I forgot. That is a stunner! The design reminds me of leaves blowing around on a windy fall day. You know how they do that swirly, circular dance close to the ground? The leaf stencil is neat. Good eye. This is so beautiful! WOW! 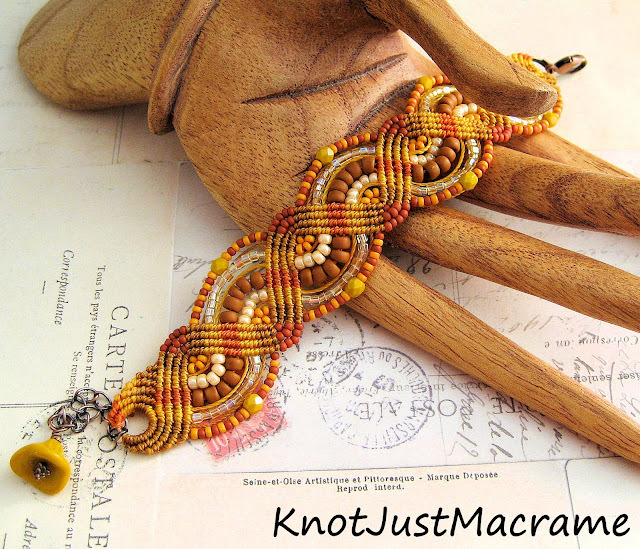 I would love to learn micro macrame! You've certainly captured the warmth and joy of autumn in this bracelet. Love the butterscotch tones paired with the cream colored beads. Wonderful... And so my favorite colors!! Every single piece lately has been fabulous, you are on a roll! This is lovely. I just love the colors in your bracelet and the reminder that beauty is around us. Wow, your braclelet is stunning. I really love the colors. How cool to find the stensil of the leaf. Absolutely gorgeous bracelet, just beautiful. you have a fantastic eye for color combos and blends ! Gorgeous work,as always! Oh Wau! You are truly talent!